Background Biomarkers are important in the diagnosis, risk stratification and management of patients with heart failure (HF). The established biomarkers of myocardial stretch, brain natriuretic peptide (BNP) and amino (N) portion of BNP (NT-proBNP) have been extensively studied, and early analyses have demonstrated response to exercise training. Several other biomarkers have been identified over the last decade and may provide valuable and complementary information which may guide treatment strategies, including exercise therapy. Methods A systematic search of PubMed, EMBASE and Cochrane Trials Register to 31 October 2017 was conducted for exercise-based rehabilitation trials in HF. Randomised and controlled trials that reported biomarkers, BNP, NT-proBNP, soluble ST2, galectin-3, mid-regional atrial natriuretic peptide, mid-regional adrenomedullin and copeptin, were included. Results Forty-three studies were included in the systematic review, with 27 studies suitable for meta-analyses. Data pooling was only possible for NT-proBNP and BNP. Meta-analyses of conventional training studies demonstrated a statistically significant improvement in NT-proBNP (pmol/L); mean difference (MD) −32.80 (95% CI −56.19 to −9.42), p=0.006 and in BNP (pmol/L); MD −17.17 (95% CI −29.56 to −4.78), p=0.007. Pooled data of non-conventional training failed to demonstrate any statistically significant improvements. Conclusion Pooled data indicated a favourable effect of conventional exercise therapy on the established biomarkers, NT-proBNP and BNP; however, this was in contrast to a number of studies that could not be pooled. Limited evidence exists as to the effect of exercise training on emerging biomarkers. Early reviews indicate that exercise training may improve brain natriuretic peptide (BNP) and amino (N) portion of BNP (NT-proBNP) in patients with heart failure (HF). A number of new trials have compared different types of conventional and non-conventional modes of training on BNP and NT-proBNP, but the optimal exercise prescription for reducing HF biomarkers is unknown. The review updates the evidence in regard to the effect of exercise training on the established HF biomarkers, BNP and NT-proBNP. Additionally, the response of a number of emerging biomarkers to exercise training has been investigated in patients with HF. The pooled analysis of conventional exercise training confirms improvements in BNP and NT-proBNP but demonstrates only limited evidence for non-conventional training. Exercise training may also improve a number of other biomarkers representative of different pathophysiological pathways involved in HF progression. The exercise prescription for patients with HF can be optimised to improve biomarker profile and hence prognosis, providing a valuable resource for both clinicians and patients. The aim of this systematic review and meta-analysis was first to update the previous reviews as a number of additional studies have investigated BNP and/or NT-proBNP after training interventions. Second, given the emergence of new biomarkers in HF trials, we intended to add to the current literature the inclusion of a selected number of emerging biomarkers. Furthermore, differing to previous analyses, we expanded our review to include additional modalities of exercise therapy due to their increasing utilisation in cardiac rehabilitation programmes and trials, which may provide alternatives for subgroups of patients with HF. Potential studies were identified by conducting systematic searches of PubMed, EMBASE, CINHAL and the Cochrane Library of Controlled Trials up until 31 October 2017. Searches included a mix of MeSH and free-text terms related to the key concepts of HF, exercise training and biomarkers. Additionally, systematic reviews, meta-analyses and reference lists of papers were hand searched for additional studies. One reviewer (MJP) conducted the search, and full articles were assessed for eligibility by two reviewers (MJP and NAS). A sample search strategy is presented in online supplementary files. Additional information was requested from five authors, with three responses. Randomised controlled trials (RCTs) and controlled trials of exercise therapy in patients with HF aged 18 years or older were included. HF type (ie, preserved, moderately reduced and reduced ejection fraction) was not considered as an inclusion or exclusion criteria. Only studies in which the authors specifically reported a patient diagnosis of HF were included. Studies assessing intervention effect on acute or decompensated HF were excluded. Exercise therapy included both conventional training, defined as aerobic training (AT), resistance training (RT) and combined AT and RT, and non-conventional modes of therapy, defined as Yoga, Tai Chi, stretching and the physical therapies of functional electrical stimulation (FES) and inspiratory muscle training (IMT). Studies must have compared an exercise intervention to a usual care or education control group, with no formally prescribed exercise, and the duration of the exercise training must have been for a minimum of 4 weeks. Studies in which the participants had participated within a formal exercise rehabilitation programme within the last 6 months were excluded. Studies were eligible to be included in the review if they reported one or more of the following outcomes in serum or plasma: BNP, NT-proBNP, cardiac troponin (cTnT), sST2, Gal-3, MR-proANP, MR-proADM and CT-proAVP. Abstracts and non-English studies were excluded. One reviewer (MJP) extracted the data. For each study, the following information was extracted: (1) author, year of publication and study design, (2) demographic and clinical characteristics, (3) exercise intervention characteristics, (4) mean, SD, P value and main findings in regard to biomarkers and (5) details of assessment methodology for biomarkers. Statistical analyses were performed using Revman V.5.3 (The Nordic Cochrane Centre, Copenhagen, Denmark). Individual meta-analyses were completed for continuous data by using the change in the mean and SD. Where the change in mean and SD was not reported, the change in mean was calculated by subtracting the preintervention mean from the postintervention mean, and Revman V.5.3 enabled calculations of SD using number of participants in each group, within or between group p values or 95% CI. Where p values were not provided, the SD of the mean difference (MD) was calculated using the formula: SD=square root [(SDpretreatment)2+(SDpost-treatment)2−(2 r ×SDpretreatment×SDpost-treatment)], assuming a correlation coefficient (r)=0.5, which is considered a conservative estimate.26 Where data were not presented in text or tables and authors could not be reached, data presented in figures or reported in prior meta-analyses were extracted or accessed where possible. Data were pooled for meta-analysis when two or more studies measured the same outcome and provided data in a format suitable for pooling. Where a study included multiple intervention groups and data were not provided for the combined intervention, data were entered separately for each group, and the sample size of the control group was divided by the number of intervention groups to eliminate overinflation of the sample size. A random-effects inverse variance was used with the effects to measure MD. We used a 5% level of significance and a 95% CI to report change in outcome measures. Both BNP and NT-proBNP are commonly reported in SI units (pmol/L) or conventional units (pg/mL). Owing to large values associated with NT-proBNP, change data were converted from pg/mL to pmol/L for both NT-proBNP and BNP for presentation. Data were converted using the following factors: for NT-proBNP pmol/L=pg/mL ×0.118 and BNP pmol/L=pg/mL ×0.289. For meta-analysis, we did not pool studies in which participants were clearly identified as only having heart failure with preserved ejection fraction (HFpEF), with other studies. We grouped studies for analysis according to conventional or non-conventional training modalities. For studies where the mean or SD of outcomes was not reported, but median, IQR or median and range were reported or where only a descriptive result was reported in regard to postintervention changes, a table and descriptive analysis are used. Sensitivity analysis: In order to evaluate the influence of each study on the overall effect size, sensitivity analysis using the leave-one-out approach was conducted. Where SD was imputed, additional analyses were also carried out with different values for the correlation coefficient (r=0.75 and 0.25) to determine whether the overall results of the analyses were robust to the use of imputed correlation coefficients. Heterogeneity was quantified using the I2 test.27 Values range from 0% (homogeneity) to 100% (high heterogeneity).27 Visual inspection of funnel plots28 assessed risk of publication bias. Study quality was assessed using the Tool for the Assessment of Study Quality and Reporting in Exercise (TESTEX)29 by two authors (MJP and NK). In case of discrepancies, a third author (NAS) was consulted. The initial search generated a total of 3419 articles. After removal of duplicates and exclusion of articles based on abstract and title, 77 full-text articles remained for screening. Full screening resulted in 43 articles meeting the stated inclusion criteria (figure 1, Preferred Reporting Items for Systematic Reviews and Meta-Analyses statement), of which 27 studies were included in meta-analyses. Details of full-text articles reviewed but excluded are provided, with reasons, in online supplementary table S1. PRISMA flow diagram. PRISMA, Preferred Reporting Items for Systematic Reviews and Meta-Analyses. 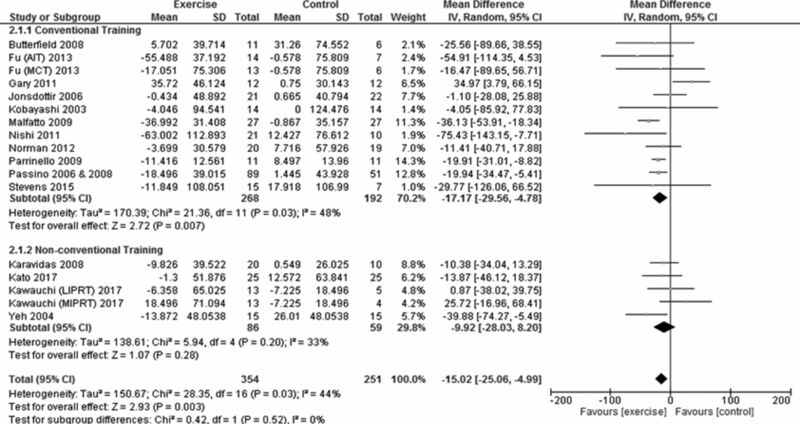 participants between exercise intervention groups, but the control group was not randomised, one38 study was a retrospective analysis and all remaining studies were RCTs. Seven studies,30 31 39–43 representing six trials, included participants with a mean left ventricular ejection fraction (LVEF) >50%, one43 of which also included participants with LVEF <50%. Thirty-six trials included participants with mean LVEF <50%, and the mean LVEF of at least three44–46 studies indicates the inclusion of participants with a range of ejection fractions, reduced, mid-range and/or preserved ejection fraction. Baseline NT-proBNP and BNP levels are provided in online supplementary table S2. A detailed description of the interventions can be found in online supplementary table S3. Thirty-four studies used conventional exercise training, eight studies used non-conventional exercise training or therapy and one study combined non-conventional and conventional training. Intervention duration ranged from 4 weeks to 9 months. Biomarker assay details are provided in online supplementary table S4. Twenty studies reported on NT-proBNP. Two studies32 33 contained an overlap of some participants; to avoid possible duplication of data, these studies are represented as one dataset in the meta-analysis. Overall, exercise demonstrated a statistically significant improvement in NT-proBNP (pmol/L); MD −47.83 (95% CI −77.23 to −18.43), p=0.001 (figure 2). Change (MD) in NT-proBNP (pmol/L) exercise versus control. For conversion to pg/mL=pmol/L divided by 0.118. AIT, aerobic interval training; CAE, continuous aerobic training; IAE, aerobic interval training; IHF, ischaemic heart failure; MCT, moderate continuous training; MD, mean difference; NHF, non-ischaemic heart failure; NT-proBNP, amino (N) portion of BNP. Pooled data from 10 studies32 33 35 37 43 47–52 (14 intervention groups, 315 exercise participants and 212 controls) demonstrated a statistically significant improvement in favour of exercise, on NT-proBNP (pmol/L); MD −32.80 (95% CI −56.19 to −9.42), p=0.006 (figure 2). Removal of the two intervention groups from one43 study, that included patients with a mean ejection fraction of 50%, improved the MD and statistical significance; MD −54.62 (95% CI −74.36 to −34.87) pmol/L, p<0.00001 (online supplementary table S5). Apart from the study by Aksoy et al,43, sensitivity analysis using the leave-one-out approach revealed that the results remained relatively stable (figure 3). Sensitivity analyses conducted for different correlation coefficients for SD imputation did not result in any significant variance in overall results. Sensitivity analysis NT-proBNP (conventional training) with study removed. AIT, aerobic interval training; CAE, continuous aerobic training; IAE, aerobic interval training; IHF, ischaemic heart failure; MCT, moderate continuous training; NHF, non-ischaemic heart failure; NT-proBNP, amino (N) portion of BNP. An additional six30 34 53–55 studies (table 2) could not be pooled due to differences in data reporting. Five studies presented data as median (IQR) or median (range), and one30 study only included patients with HFpEF. Two studies34 reported preintervention to postintervention NT-proBNP changes in exercise participants, but only one study reported a significant difference compared with control participants. Pooled data from two45 56 studies (55 exercise participants and 59 controls) failed to demonstrate a statistically significant improvement in NT-proBNP (pmol/L); MD −157.47 (95% CI −327.64 to 12.70), p=0.07 (figure 2). Notably, the large size of the improvement was due to the inclusion of one study45 (figure 4). One42 additional study, in patients with HFpEF, not pooled, failed to demonstrate any significant change (table 2). Sensitivity analysis NT-proBNP (non-conventional training) with study removed. NT-proBNP, amino (N) portion of BNP. Twenty-two studies reported on BNP. Two32 33 studies contained an overlap of some participants; to avoid duplication of data, these studies are represented as one dataset in the meta-analysis. Overall, exercise demonstrated a statistically significant improvement in BNP (pmol/L); MD −15.02 (95% CI −25.06 to −4.99), p=0.003 (figure 5). Change (MD) in BNP (pmol/L) exercise versus control. For conversion to pg/mL=pmol/L divided by 0.289. AIT, aerobic interval training; BNP, brain natriuretic peptide; LIPRT, low-intensity inspiratory training and peripheral resistance training; MCT, moderate continuous training; MD, mean difference MIPRT, moderate-intensity inspiratory and peripheral resistance training. 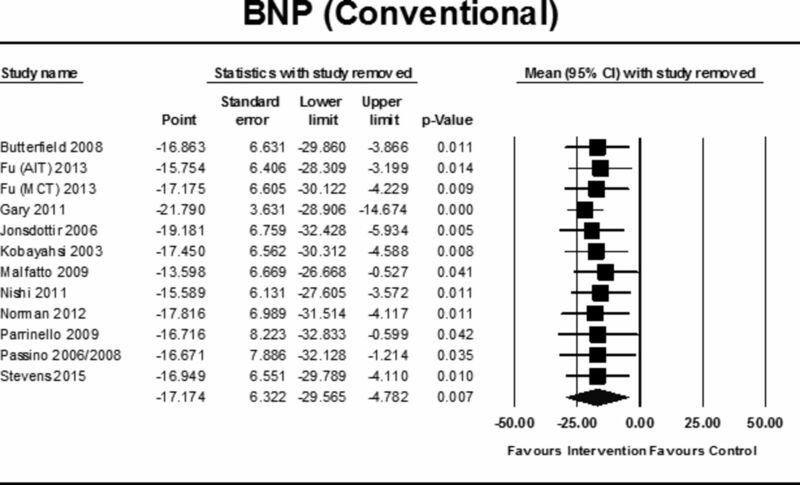 Pooled data from 11 studies32 33 38 46 57–64 (12 intervention groups, 268 exercise participants and 192 controls) demonstrated a statistically significant improvement in BNP (pmol/L) in favour of exercise; MD −17.17 (95% CI −29.56 to −4.78), p=0.007(figure 5). Sensitivity analyses using the leave-one-out approach revealed that the study by Gary et al 59 impacted the size of the result, with an increase in MD and statistical significance with removal of this study (figure 6). Sensitivity analysis BNP (conventional training) with study removed. AIT, aerobic interval training; BNP, brain natriuretic peptide; MCT, moderate continuous training. An additional five22 36 39 40 65 studies using conventional training (table 2) reported on BNP concentrations, but were not pooled due to differences in data reporting. Two22 36 studies reported data as median (IQR), two39 40 studies were in participants with HFpEF and one65 study did not provide post-data but noted no change. Of the five studies, two22 36 reported decreases post-training in exercise participants with no change in controls. The two39 40 studies with HFpEF patents failed to find any change. Pooled data from 4 studies66–69 (5 intervention groups, 86 exercise participants and 59 controls) failed to demonstrate a statistically significant improvement in BNP (pmol/L) exercise versus control; MD −9.92 (95% CI −28.03 to −8.20), p=0.28 (figure 5). Sensitivity analysis indicated that the study by Kawauchi et al 68 affected the magnitude of the result (figure 7). Sensitivity analyses conducted for different correlation coefficients for SD imputation did not result in any significant variance in overall results. Two41 70 additional studies, using non-conventional training, were not pooled. One70 reported data as median (IQR), and one41 was in patients with HFpEF, and both failed to demonstrate any significant change (table 2). Sensitivity analysis BNP (non-conventional training) with study removed. BNP, brain natriuretic peptide; LIPRT, low-intensity inspiratory training and peripheral resistance training; MIPRT, moderate-intensity inspiratory and peripheral resistance training. Two studies compared Gal-3 in exercising and control participants. However, differences in data reporting did not allow for data pooling. Billebeau et al 22 observed a statistically significant (p<0.001) median decrease of 6.3% in the exercise group (n=107) with no change in control patients. 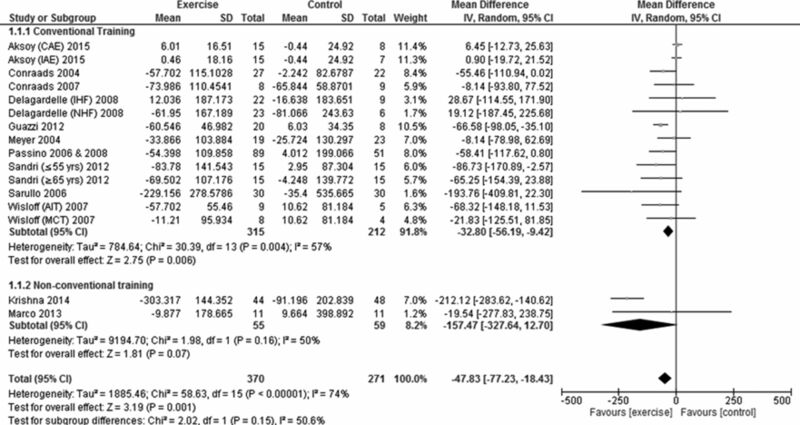 While Fernandes-Silva et al 23 reported no statistically significant difference in the mean change between exercise and control groups (p=0.69). One study reported predata and postdata in regard to the effect of exercise training on sST2 levels. A statistically significant (p=0.035) median decrease of 7.4% was observed post-training (n=97) by Billebeau et al,22 with no change in controls. Two studies reported on postintervention MR-proANP concentrations. Billebeau et al 22 observed a statistically significant (p<0.001) median decrease of 16% post-training (n=105), with no changes in control participants. In contrast, the post hoc analysis of the Ex-DHF pilot trial by Trippel et al 31 noted no significant treatment effect in patients with HFpEF. Two studies reported on postintervention MR-proADM concentrations. Billebeau et al 22 observed a statistically significant (p=0.001) 6.4% median decrease in MR-proADM (n=103), with no changes in control participants. In contrast, Trippel et al 31 noted no significant treatment effect in patients with HFpEF. One study by Trippel et al 31 reported on CT-proAVP levels and failed to find any statistically significant change post-training or compared with the control group in patients with HFpEF. A median TESTEX score of 8.5 out of 15 was obtained (range 6–12) (online supplementary table S6). Details of randomisation procedures, activity monitoring of control groups, adjustment of relative exercise intensity and provision of adequate details to calculate exercise energy expenditure were frequently lacking. Meta-analyses indicated a moderate level of heterogeneity. Visual inspection of the funnel plot showed slight asymmetry (online supplementary figures 1A,B). 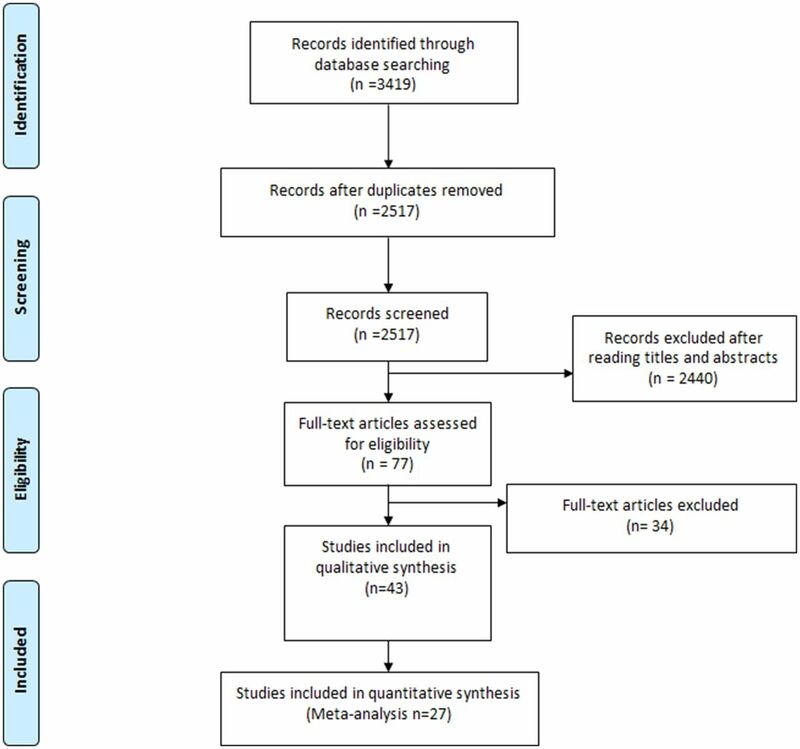 This systematic review and meta-analysis compiled evidence from a large volume of studies assessing the effect of exercise therapy on established and a selected number of emerging biomarkers in patients with HF. Different to previous analyses, both conventional and non-conventional modes of training were examined. When analysed separately, conventional training demonstrated a statistically significant improvement in NT-proBNP and BNP, while pooled analyses of non-conventional training failed to demonstrate any significance. While BNP and NT-proBNP are raised across the HF spectrum, as levels may be lower in HFpEF, and in some instances close to normal, we excluded studies from pooled analyses that only included patients with HFpEF. However, it is highly likely that a number of other studies included in the analyses with mean ejection fractions >40% would have also included patients with HFpEF, and it is possible that this could be reflected in the variability of the results. The favourable result demonstrated in pooled analyses of conventional training is consistent with previous reviews24 71 and a 2011 IPD meta-analysis.25 However, in contrast to our pooled results, of studies unable to be pooled, only two of seven studies for BNP, and two of the seven studies for NT-proBNP, indicated any significant change post-training or compared with controls. Furthermore, one of these studies was a sub-analysis of a large cohort from the HF ACTION trial, which found that levels of plasma NT-proBNP did not significantly improve after 3 months of AT,53 clearly contrasting with our result and previous analyses.24 25 71 However, adherence and participant crossover issues may have confounded the results of the HF ACTION trial. It is also possible that a longer intervention duration may have resulted in significant changes, as seen after 9 months by Passino et al,32 although Sandri et al 51 demonstrated significant decreases after only 4 weeks of endurance training. While BNP/NT-proBNP remains the gold standard HF biomarkers, with proven prognostic value, there are limitations. Age, gender, arrhythmias, obesity, renal function and comorbidities10 12 may all affect concentrations; hence, biomarkers less affected by these issues can provide valuable information. Furthermore, as biomarkers of myocardial stretch, BNP/NT-proBNP is only reflective of one pathophysiological pathway involved in HF; hence, biomarkers reflecting other pathways may provide new and valuable information and complement BNP/NT-proBNP. Both Gal-3 and sST2 have been studied as emerging biomarkers in HF, and now have a Class IIB recommendation for risk stratification by the American College of Cardiology/American Heart Association (ACC/AHA) (2013) guideline for HF management.7 Gal-3, a β-galactoside-binding lectin, plays a dominant role in inflammation, fibrosis and cardiac remodelling.10 12 sST2, a member of the interleukin (IL)-1 receptor family and defined as a ligand for IL-33, is considered a cardiovascular stress protein, associated with fibrosis, cardiac and vascular remodelling and inflammation.72 Initial evidence also indicates that other novel biomarkers, such as CT-proAVP20 73 74 and MR-proADM,75 both biomarkers of neurohormonal activation, also have prognostic value in HF. Reduced exercise capacity is a major hallmark of HF, and NT-proBNP is a strong predictor of VO2peak.77 Changes in BNP and NT-proBNP have been correlated with changes in VO2peak and suggested therefore as a possible surrogate for evaluating training responses.25 Only a minimal number of studies included in the review reported associations between change in peak VO2peak and biomarkers. Ahmad et al 53 did however observe that in patients in whom NT-proBNP levels decreased, there was an increase in VO2peak, despite finding no significant change in NT-proBNP. While Passino et al 32 observed that changes in VO2peak correlated significantly with decreases in NT-proBNP and BNP. Recently, Billebeau et al found that of all the biomarkers they tested, for predicting change in exercise capacity, MR-proADM best correlated with VO2peak.22 Given that adrenomedullin originates not only from the heart but also from multiple organs, tissues and blood vessels78 and that the mechanisms associated with improved exercise capacity in HF involve cardiac, vascular and skeletal muscle adaptations,79 a relationship between MR-proADM and improved exercise capacity makes sense. Levels of BNP and NT-proBNP are elevated irrespective of ejection fraction; although they are generally lower in HFpEF compared with heart failure with reduced ejection fraction (HFrEF).80–82 Patients also present with elevated levels of a number of other biomarkers reflective of different pathophysiological pathways. Currently, there are limited data on the role of exercise training and biomarkers in HFpEF, and none of the HFpEF studies included in the review reported any significant changes in the biomarkers. Furthermore, it is likely that there exist different biomarker profiles for HFrEF and HFpEF.83 84 Moving forward, these different biomarker profiles may provide valuable information for treatment strategies, including exercise. To date, the majority of HF training studies have used conventional modes of training; however, not all patients can or are willing to participate in these activities. Women, for example, may be more likely to attend mind–body interventions, such as Tai Chi and Yoga, for cardiac rehabilitation purposes.87 88 Furthermore, both FES and IMT offer alternative modes of physical therapy, particularly in patients unable to participate in more conventional modalities. Individually, the included studies investigating FES and IMT failed to demonstrate any significant change in BNP or NT-proBNP compared with control groups. However, the combination of these non-conventional modes with conventional training may provide possible synergistic effects,89 as demonstrated by Caminiti et al 90 with combined Tai Chi/endurance training and Adamopoulos et al 89 with combined IMT/AT. Furthermore, other modes of non-conventional exercise therapy, such as weight-supported91 and robot-assisted92 exercise training, have demonstrated improvements in BNP and NT-proBNP in patients with HF and may be beneficial in some subgroups. Biomarkers are used in HF clinical trials for a number of reasons,10 including establishment of inclusion criteria, outcome measures, explaining therapeutic efficacy and as a target for therapy.93 Biomarkers and biomarker panels may aid in identifying subgroups of patients with HF who may have a more favourable response to exercise therapy, distinguishing responders and non-responders21 23 in terms of specified outcomes including functional and long-term outcomes. Different biomarkers may provide further insight into the downstream molecular mechanisms associated with improvements from exercise training.21 It could be possible that different biomarker profiles respond differently to different intervention characteristics, such as intensity, perhaps allowing further tailoring of the exercise to the individual. Furthermore, biomarkers, with their prognostic utility, may provide useful postintervention information, indicating improvements when other favourable outcomes may be absent. It remains premature to draw too many conclusions about the relationship between changes in emerging biomarkers and exercise training, and the utility of these biomarkers in HF is yet to be fully established, but it presents as an interesting and important area for future research. 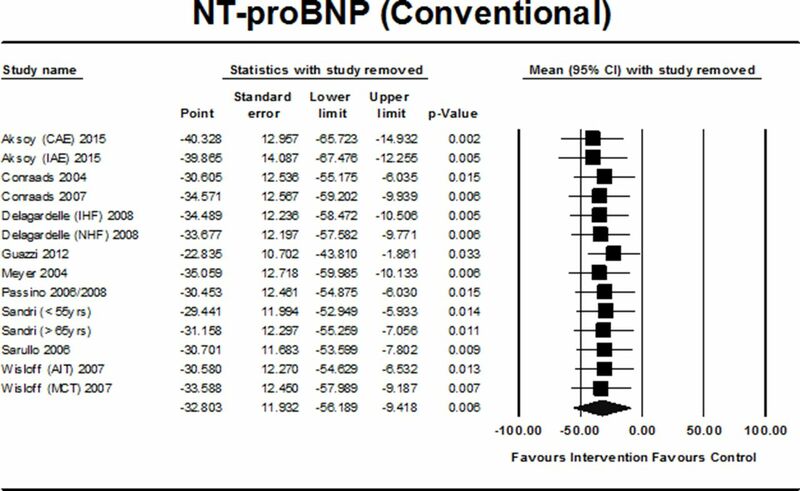 To our knowledge, this is the first meta-analysis of BNP and NT-proBNP to include training studies beyond the conventional AT and RT modalities and the first review to consider exercise therapy and emerging biomarkers in HF. We aimed to provide a meta-analysis of studies reporting on a selected number of established and emerging biomarkers. However, as biomarker distributions can be skewed, study data may often be presented as median (IQR) or median (range), which precludes it from inclusion in meta-analyses. Valuable information may be ignored if a number of studies are excluded; therefore, on initial review and identification of a number of studies that had examined biomarkers and reported data as median or provided a descriptive result, we felt that the inclusion of these studies would enhance the value of the review and analysis. Therefore, we included results of studies reporting data that were considered inappropriate for pooling and only provided a descriptive analysis of these studies. Studies in which biomarkers were assessed as secondary outcomes may not have been adequately powered to detect significant differences in biomarkers. Furthermore, the studies included in the review reported a wide range of intervention durations, training frequency, session times and intensity. In regard to data pooling, we measured the difference between preintervention and postintervention means; however, in cases where exact p values within groups or 95% CI were not available, we imputed the SD, and hence statistical analysis depended on extrapolated data. However, our imputation was conservative, and sensitivity analyses were conducted for different correlation coefficients. Abstracts and trials not reported in English were excluded and could have led to publication bias. Pooled data of conventional training modalities indicated a favourable effect on the established HF biomarkers, NT-proBNP and BNP, contrasting with information from a number of non-pooled studies. Limited evidence exists in regard to exercise training and emerging biomarkers. Given the complex pathways involved in the onset and progression of HF, more research is required to establish exactly how established and emerging biomarkers can be used in exercise training in this population. The use of multiple biomarkers is an area of active research in HF, and future studies using biomarker panels may prove beneficial in guiding non-pharmacological therapy such as exercise by facilitating a more precise approach to exercise for subgroups of patients.
. Exercise‐based rehabilitation for heart failure. The Cochrane Library 2014.
. Handling continuous outcomes in quantitative synthesis, 2013.
. Effects of Exercise Training versus Attention on Plasma B-type Natriuretic Peptide, 6-Minute Walk Test and Quality of Life in Individuals with Heart Failure. Cardiopulm Phys Ther J 2012;23:19-25.
. Effect of weight support exercise therapy on the cardiac function in patients with chronic heart failure. J Hainan Med Univ 2016;22:21–3. Contributors MJP designed the review, conducted the literature search, extracted data, undertook data analysis and wrote the manuscript. NK assisted with the preparation of the study quality assessment and review of the manuscript. NAS assisted in selecting eligible articles and reviewed and edited the manuscript. All authors approved the final manuscript. Funding MJP is supported by an Australian Postgraduate Award Scholarship. Disclaimer The authors take responsibility for all aspects of the reliability and freedom from bias of the data presented and their discussed interpretation.